Those of us who love military rifles have this overwhelming desire to modify them as soon as we get them home. For those who like an older design upgrading them can be somewhat of a challenge. After reviewing the Golani from Century International I bought it. My first intention was to leave it as is and use the good ol iron sights, no flashlights, scopes etc. 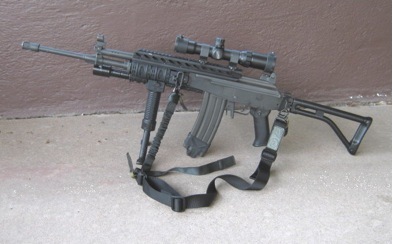 The more I thought about it I realized that a lot of Golani owners probably want these add ons in order to make the Golani a more capable modernized rifle. I made a list of the most common add ons that shooters add to their AR15’s without making it ridiculously heavy and clumsy. With list in hand I started an internet search for items fitting the criteria I set for the Golani/Galil rifle. Finding a suitable quality rail system wasn’t terribly easy as most systems were plastic or of poor design. I found an excellent rail system made exclusively for the Golani. 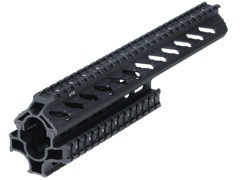 The rail system is made by UTG from aluminum with a durable black finish. As you can see from the picture it replaces the factory handguard. Rails are on all four sides and come with rubber covers. The top rail extends back to the rear sight. Installation is simple and takes about 15 minutes to complete using the included six hex bolts. Material:AluminumWeight:13.6 ozPieces:2Rail Type:Picatinny/WeaverNo. of Rails:4Length:11.4 inchWidth:2.3 inchHeight:3.2 inch. An optic was next but which type? I’ve used many kinds of optics on AR’s from red dots to Trijicon ACOG’s. 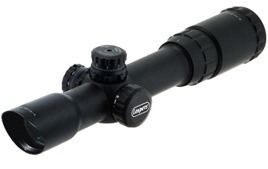 A scope that has become popular of late is the designated marksman scope. The power range is from 1X4. This allows the shooter to engage targets from CQB range to 500 meters. They also have a long eye relief averaging four inches. This allows the shooter to keep both eyes open using the 1X setting. This prevents a limited field of view when things get up close and personal. Leapers makes just such a scope. The next item I wanted to add was a good quality sling. My criteria includes a sling that is easily adjusted for length, quickly removed, comfortable, adaptable and lastly durable. 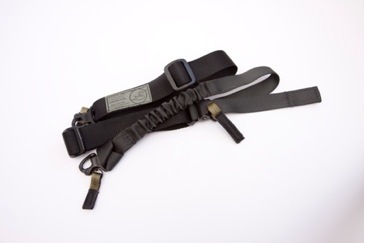 For anyone who has an AR15, Golani, FN SCAR or whichever you know there are a huge number of slings to choose from. Some are very well made and fit most shooters needs while others are junk that won’t last six months before falling apart. It’s really not a good idea to cut the budget on your sling. You’ll save money in the long run buying quality the first time out. I scoured the internet for anything new I may have missed since the last time I looked for a new sling. I currently use a Troy single point sling on an AR but this time I wanted one that would also allow single point mounting as well as dual point mounting. I found what I was looking for at Mounts Plus. I contacted my friend Stephen at Mounts Plus about a new sling and had one in mind. Stephen steered me in the right direction by suggesting the A.R.M.S. company SWAN sling rather than the one I had my eye on. He was right this is a fantastic sling and I’m glad I bought it. The SWAN (from Mounting Solutions) sling has metal QD (quick disconnect) hooks on both ends. If you look at the picture above you’ll see one of the QD hooks. Note the lighter green nylon piece attached to a small metal ring. The hook is spring loaded. Pulling the nylon piece trips the catch releasing the hook allowing you to remove the sling. Pushing the hook over the connection locks it back in place securely. 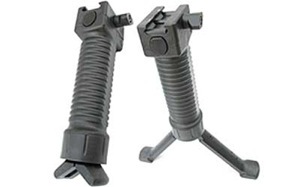 This feature allows the sling to change from dual mount to single point. The next picture up shows a similar tab halfway up the body of the sling. This tab can be pulled up or down which lengthens or shortens the sling. This allows the user to carry the rifle close to the body. Another item I wanted was a front rail grip. I decided on the Grip Pod also from Mounts Plus. Now I know what you’re thinking, this thing is ugly and kinda big. I couldn’t agree more and yes it’s not very attractive but in this case function trumps form. The Grip Pod is in use by all branches of the military as well as federal law enforcement agencies. The military version differs from the law enforcement type having steel reinforced legs. The law enforcement version doesn’t have these steel reinforcements. It’s still very strong and darn near impossible to break. Note in the above picture you’ll see a round button at the top front. This is the button that is pushed to activate the spring ejecting the two legs very quickly. When the user is ready to retract the legs you simply use one hand to pull the legs together and push them up locking them back in place. It also has a heavy screw attaching it to the rail system. This also allows the Grip Pod to be removed or attached easily. This video demonstrates the Grip Pod in use. The last item on the list is a flashlight. I chose the Hoyt H-1. This light fits in any 25mm rail mount. It’s powered by two CR-123 batteries and has a run time of 100 minutes at 155 lumens. This model has four modes. 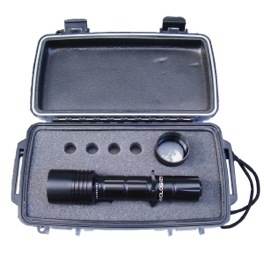 I chose to use mode 3 which with one click is a full power beam of 155 lumens. Two clicks and you have a disorienting full power strobe setting. The light comes in a hard plastic black waterproof case. Not everyone will want all of these additions to their rifle. Customizing any gun is purely a personal preference so I am by no means saying everyone needs to use these items to have the perfect rifle. 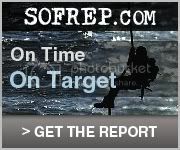 My intention in this article is to show the owner of this or a similar rifle different options they have available to them. The pros and cons are for the reader to conclude based on their own needs and experiences. I hope you’ve enjoyed the article and found it useful. Your questions and comments are always welcome! Remember any purchase you make from Mounts Plus by clicking on the ad here on the blog and enter Gunner777 at checkout you get 10% off even on ACOGs etc. This entry was posted on June 7, 2012 at 1:51 pm	and is filed under AK-47, Golani, Military and Police Rifles, Optics, Videos. Tagged: Century Arms, Golani mods. You can follow any responses to this entry through the RSS 2.0 feed. You can leave a response, or trackback from your own site. Well sir you’ve already done pretty much what I would have done. The only thing I can think of is maybe a lightweight bi-pod that’s easily removed. They also make a front sight replacement for these with a fiber optic tube and an improved rear sight much like the Garand rear sight.